During the past few decades, the increased incidence of solar UV radiations (280-400 nm) and its harmful impacts, particularly on human skin have fueled worldwide concern to search for an effective UV sunscreen compound with the ability to provide maximum photoprotection. Several synthetic suncare products available in the international market may cause negative side effects that can’t be overlooked. A number of biomolecules have been reported from different natural sources with great UV absorbing/screening functions. There is a need to explore the photoprotective role of these various natural UV sunscreening compounds so that they can find applications in UV-screening cosmetics for the benefit of human beings. The present book Sunscreens: Source, Formulations, Efficacy and Recommendations provide an overview of the current knowledge of the various sunscreening compounds along with their sources, formulations, and efficacy as well as recommendations with regard to the photoprotective function in response to intense solar radiations. This book describes the recent progress and fundamental backgrounds of various UV absorbing or sunscreening compounds derived from different sources. An effort has been made to provide substantial information on various natural sunscreening molecules and their potentials as an arsenal of effective sunscreen ingredients meant for adequate protection from harmful UV radiations. 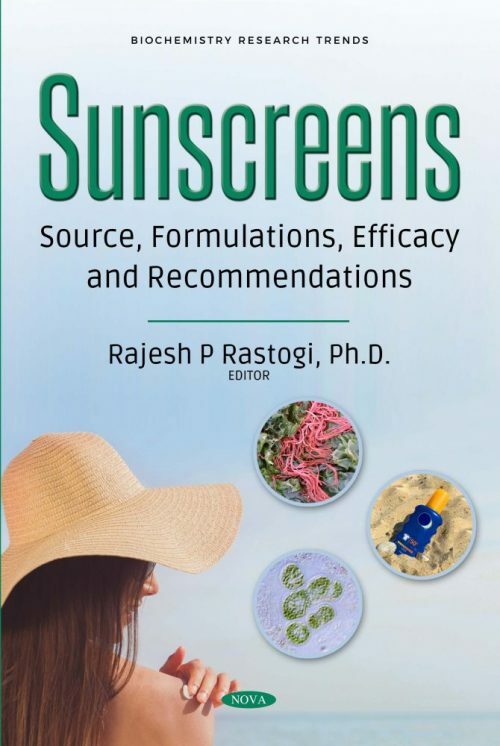 Different chapters of the book address various questions pertaining to the naturally sourced sunscreen from microorganisms to higher plants, ideal for the formulations of sun care and cosmeceutical products. Undoubtedly, the contents of the book would be highly useful for graduate/postgraduate students, teachers, biochemists, and researchers in the fields of cosmetic science, photobiology, medical microbiology, and metabolic engineers engaged in the formulations and development of broad spectrum natural sunscreens or anti-aging products.